Automotive Sector - DTR VMS ITALY s.r.l. The heart of our anti-vibration technology is formed by bonding together rubber and metal parts in a way that maintains an elastic connection between two rigid bodies, damping relative motion, and reducing transmission of noise and vibration. These perform the function of containing forces and reducing vibration transmitted from the engine to the chassis. Hydraulic damping can be included to reduce engine movement caused by uneven roads, further adding to the comfort of the ride for driver and passengers. These perform the function of connecting the control arms or axles to the vehicle, managing the forces occuring under conditions of stress and helping to maintain the correct grip under acceleration, cornering, and braking. They also reduce vibration induced directly by the road surface, greatly improving comfort. 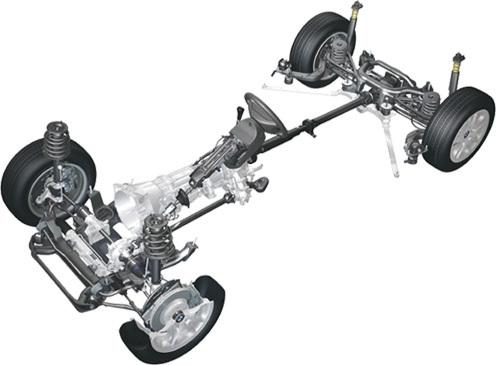 These form elastic joints between the spring /shock absorber assembly and the chassis or body of the vehicle. Their function is to dampen vibrations generated within the shock absorber itself and from external forces acting on the car. Road vehicles have many components such as driveshafts and camshafts that rotate at high speed, and the slightest imbalance can induce high levels of uncomfortable and damaging vibration. Torsional dampers are fitted to counteract these vibrations, increasing comfort for the occupants and prolonging vehicle life. Constant Velocity Joint (CVJ) boots are made of natural or thermoplastic rubber compounds, and perform a vital and demanding role protecting the moving joints of the vehicle’s suspension and steering systems. They are subjected to a high degree of flexing, and are under constant attack from lubricating grease and weather. DTR VMS Italy’s advanced technology and state-of-the-art manufacturing ensure an excellent product that will fully preserve the most vulnerable parts of the vehicle subsystem. We will contact you soon as possible. © 2017 DTR VMS ITALY s.r.l.